Tauberbischofsheim is situated at the western end of the Tauber valley - marketed heavily in German as the "liebliches Taubertal" ("the lovely Tauber valley"). Rothenburg is at the other end of the valley and there are a number of very pleasant small villages and towns along the country roads: Creglingen, Bad Mergentheim and Lauda-Königshofen amongst them. As a literal German translation would suggest, the town came to prominence through its connection with religion and the abbey that was built here. 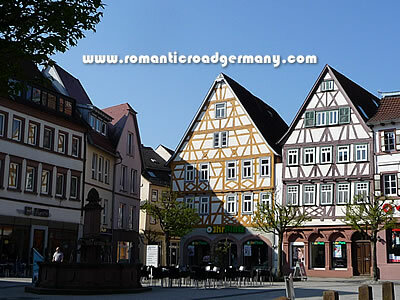 Nowadays it is one of the first stops on the Romantic Road heading south from Würzburg and it is close to the motorway exit for those concentrating on the Tauber valley and its walking and cycle paths specifically. The settlement of Tauberbischofsheim has a long history but, ironically, the name is of relatively recent vintage. Before the middle of the 19th century it was known simply as "Bischofsheim". Although archaeological discoveries point to a long period of settlement on the site, the town is first mentioned in the 9th century in connection with the life of St Lioba. St Lioba was actually part of a group of English missionaries, led by St Boniface, who came to this part of Germany in the middle of the 8th century. She was related to St Boniface in some fashion and was put in charge of a convent founded by him in Tauberbischofsheim. She is now the patron saint of the town. The town came under control of the Prince-Bishops of Mainz in the 13th century and it was they who built the former castle at the top part of the central historic part of the town. 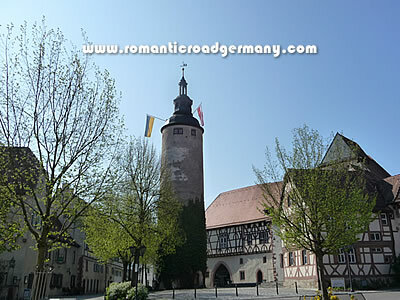 The castle is now given over to a Regional Museum and the old watchman's tower and living quarters, the Türmersturm, is the symbol of the town. Many of the older buildings in the lower part of the town date from the Middle Ages, while the 18th century Church of St Lioba and the 19th century Town Hall in the central square are from much later periods. As well as its position on the Romantic Road, Tauberbischofsheim is also on the Siegfried Route through the Odenwald and is an Olympic training centre for fencing.